Lemon Lemongrass Vitalizing Bath Essence awakens the senses and energizes the mind. The bright scent of sun-ripened lemons harmonizes with fresh lemongrass to uplift your mood. Formulation: Lemon peel and lemon essential oil tone skin, helping to reduce the appearance of cellulite as part of a Dr. Hauschka Body Care routine. Sunflower seed oil gently protects moisture. Sulfated castor oil enables bath essence to easily disperse in water. The lemon bath essence is my favorite. It is both refreshing and relaxing and particularly nice on a summer evening. Gentle Lemon Lemongrass Vitalizing Bath Essence! I bought this after rereading Nora Ephron's book and remembered how much she raved about it. It's just as amazing as she said. The scent is lovely and my skin was very soft. She was right about the recommended usage, you'll definitely need at least 2-4 cap fulls to enjoy this to the maximum. I have sensitive, dry & psoriatic skin, so I'm very careful about what I use. I had no problem with this product and was extremely pleased at how my skin felt afterwards. I'm so completely happy with my purchase and will definitely purchase again. I really wish it was available in a larger size though. I can't get enough of Dr. Hauschka's bath essence and hate running out so quickly. Thank you for such a lovely product. My daughter, son, and I all use this in our baths. It's a great clean scent for the whole family. It smells incredible and it revitalizes my whole body, it's absolutely magnificent! Dont hesitate because of the past reviews. To me, this is an energising pick-me-up this winter. A Simple Clear scent not clean as in soapy. Uplifting certainly. Very nice!!!! A good substitute for Lavender Bath Essence which was one of the BEST Products you had. I truly miss that product, please bring it back!!! Packaging was stained and the product was dispensed, that gave me my first impression about this product. when I opened the package. I wanted to post a picture but dont't see it is possible on your web-site. 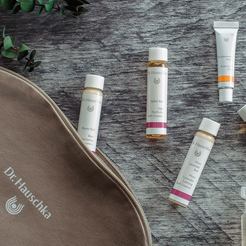 I also want to say, I always make my orders on Dr. Hauschka official website because I want to get fresh products. I was very disappointed to receive the product with expiration in five months (03/2016). But Thank you for the free samples, Dr. H is still my favorite brand. Add 1-3 capfuls or as desired of the bath essence into the stream of running water as the bathtub fills. Shake well before using. Some separation or settling is normal for a natural product. For a refreshing facial rinse after cleansing, add a small amount to a basin of warm water. This is especially beneficial to those with oily skin, helping to cleanse skin and tone pores. Refresh the air in any room by adding a few drops to a bowl of warm water.